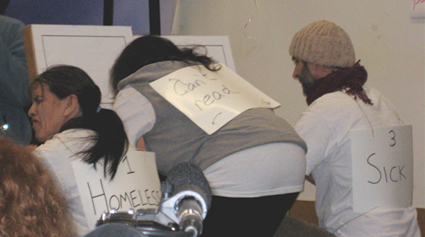 Vancouver Poverty Olympics » What happened at the Poverty Olympics? 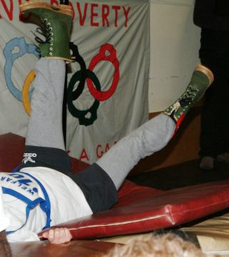 What happened at the Poverty Olympics? 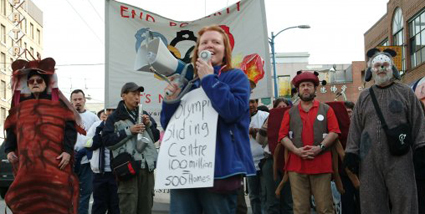 The Poverty Olympics was held on February 3, 2008 in the Downtown Eastside of Vancouver, Canada. It was a fun afternoon intended to highlight the fact that very little social spending is being directed to address the devastating levels of poverty and homelessness in BC, while billions of dollars are being spent on facilities and infrastructure for the 2010 Winter Games. The afternoon began with a torch relay stopping traffic around the busy intersection of Main and Hastings. The parade then headed into the Carnegie Theatre followed by the huge supporting crowd. 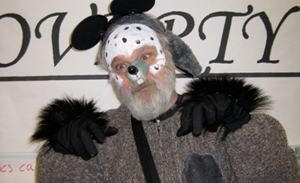 Inside the theatre, the MC, Chewy the Rat, welcomed everyone to the First Annual Poverty Olympics. Old Hands then kicked off the opening ceremony with a rousing speech and Aboriginal prayer. 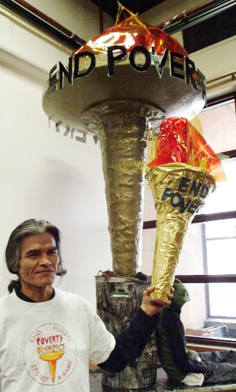 After that, the torch relay leader lit the End Poverty Torch, which is a massive sculpture made by local artists that will symbolically stay alight until poverty ends in BC. The choir’s rendition of the Poverty Anthem continued the Opening Ceremony – see the lyrics below. 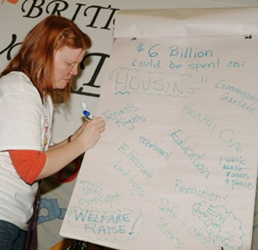 In the only serious moment during the event, Jean Swanson then made a speech highlighting the fact that the provincial and federal government surpluses could be used to end poverty and homelessness in BC. 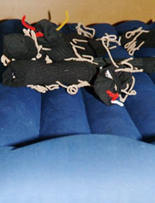 Back into light-hearted mode, the mascots – Itchy the bedbug and Creepy the Cockroach – came out and danced to ‘We’re in the Money’. 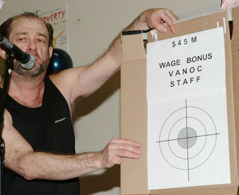 This event featured several contestants from Stream of Justice – Nancy Employable on the $610 welfare rate, Nathan Average with a solid full-time job, Rachelle Single Mom, Judy Refugee, and Brent Trainee – trying to jump over the poverty line. 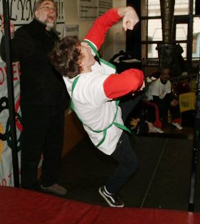 Nathan Average was the only contestant who made it but he unfortunately injured himself on the dismount and ended up on disability income so on his second jump he failed to get anywhere near the poverty line. 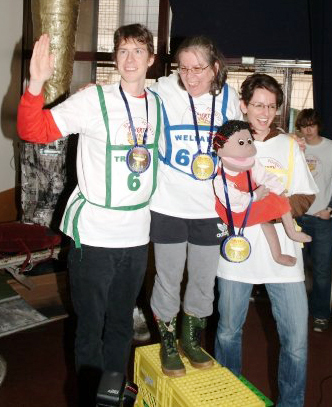 In spite of there being no winners, the contestants still received medals. 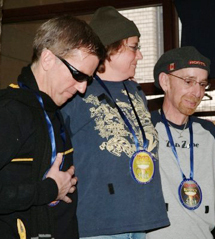 In this event, 3 contestants – homeless, sick, and illiterate – fought their way over, under, and through the barriers to getting on welfare (the 3 week work search, 2 year independence test and online orientation). They finally made it to the welfare office only to find that it had just closed. So they resigned themselves to waiting on the streets until Monday morning. 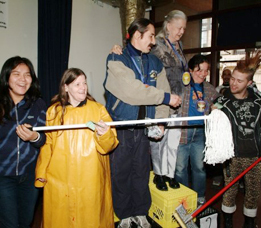 After the hurdles, contestants from BC Persons with AIDS attempted the long jump over the bedbug-infested mattress to highlight the bedbug epidemic in the Downtown Eastside. 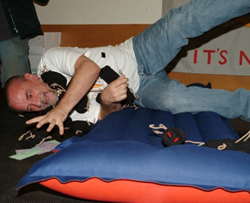 The winner in this game was the one with the least bedbugs attached to their clothing after lying on the mattress. 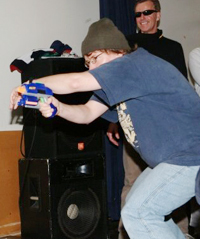 The same contestants from BCPWA then competed in the buy-athlon where they attempted to hit several targets featuring Olympic costs. In this event, the target was a brave Carnegie volunteer dressed in full-length rain gear and the curling rocks were made of jello. 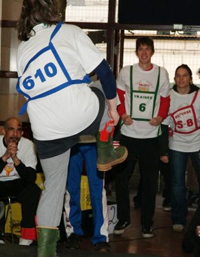 Volunteers from the audience attempted to throw their rocks at the housing promises they wanted to see while other volunteers guided them with mops instead of brooms – a messy but fun event to finish off. 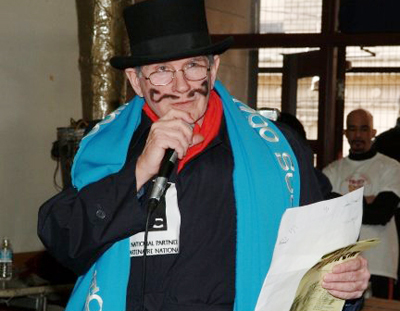 Throughout the afternoon, the bad guy Mr. Bid, bloated and covered with Olympic sponsor logos, made several appearances and tried to diminish our protests. He was quickly booed into silence by the audience. 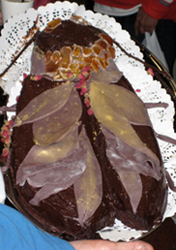 The Closing Ceremony consisted of brainstorming with the audience to come up with Olympic legacies, and then finally the Cockroach cake made its appearance. 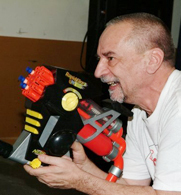 It was a fantastic day and generated a lot of media attention – can’t wait until next year!